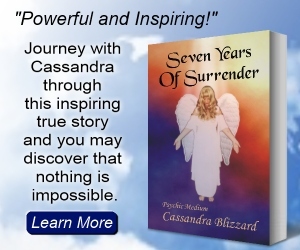 Cassandra Blizzard is a highly acclaimed, internationally known Psychic Medium. She is known worldwide for her accurate and detailed readings. Cassandra has the ability to see, sense, and hear those who have crossed over into spirit. Did you know Cassandra is also an award winning author of over 37 books? The Whisper Of Wings is a popular Historical Romance under her pen name Cassandra Ormand. In between Cassandra’s busy reading schedule and writing her book series, she is also hard at work putting together live group medium events. Yeah, she’s a busy girl to say the least. The next one will be in the Daytona Beach area. We will notify all of Cassandra’s newsletter subscibers when we have a date. I’m really excited about my upcoming book OF THE SOUL, but I’m even more excited about the new developments in my website. Soon, we will be unveiling a more interactive section of my website where people have even more opportunities to learn about self, soul, and how to achieve a better life. We are working really hard to get this off the ground. For now, it is in the baby stages, but we will let everyone know when the site is ready for launch. My manager has also introduced me to tout, and with time permitting, I am sending out some brief messages and brief glimpses into my life. It’s not always going to be pretty, folks. Try getting me to stay serious in these touts. That’s probably going to be an iffy prospect, as I tend to have an odd sense of humor about things. But just know that my heart is always in the right place, and I do take the rest of my job seriously, as you can probably tell if you’ve been reading my series of books. But, hey, we all need laughter in our lives, and I do love to laugh. But enough about that…I wanted to talk about something that is very close to my heart. Anyone who knows me knows that I love mediumship. That is my forte and it is one of my main passions in life. Making contact with souls that have crossed over has been the pivotal moment in my life and oftentimes brings me balance in the middle of crisis. It can do the same for you. But losing someone is painful, and many people don’t understand the importance of the grieving process and how a mediumship session can help. Grieving is a normal process that all human beings experience after a loss. There are no hard ground rules for this grieving process, as all of us grieve a little bit differently. But the cycle of grief is a necessary function of the human psyche and should never be short-circuited by dangerous chemical compounds that dampen emotions. (I speak more extensively about this in my book A World Without Color.) Losing someone you love is devastating. My job is to help my clients understand the soul’s journey and to help my client’s to grieve in a healthy way, with a healthy understanding of what lies beyond for all of us. When someone crosses over and takes the journey “home,” oftentimes the relatives who are still living feel a range of emotions from sadness, emptiness, deep loss, anguish, depression, anger, and sometimes even guilt. Even if we know that the soul of our loved one still lives on in another form, this doesn’t always make the transition less painful to those of us left behind. We feel sadness and loss because that loved one is no longer here in the physical, and we can’t reach out and touch them when we want or need to. A medium helps keep the good memories alive and helps the soul to be more tangible to the living in times of grief. That is why a session with a good medium is so healing. A medium session offers closure and healing for the grieving. So many times in a session I have answered questions for clients that could never have been answered without having made direct contact with the soul. It’s a beautiful moment when I see the relief on a client’s face at hearing that all is well and that they can now let go of any self-blame. I see the shoulders relax, the smile break over my client’s face, and this makes my job worth doing. Despite the wear and tear on my body that comes with working in highly resonant states, I feel blessed to offer this gift to people. Relatively speaking, our time in the physical world is very short. Make the most of these moments. Live your life well. Live with passion. And always remember fondly those souls who have crossed back into their more natural energetic state. The souls always remember the laughter, the joy, the love. We should do the same. Let the negativity fall by the wayside and learn to live with abandon. See the world as a child would: as a wonderful place to explore. And always acknowledge the beauty of the souls who have gone on before. Life is worth living, every second of every day. Be joyful and know that you are blessed, you are loved, and you are worthy. Check out Cassandra’s new Tout page and send her a reply tout!